Providing you the best range of autofy rain suits and autofy bike 2 men rain cover bike riding accessories with effective & timely delivery. Autofy Micro Polyester Multi-Purpose Complete Raincoat, Rain Suit, Rain Wear comes with a carry bag is available at a very low and reasonable price. Vehicle Compatibility: Can be weared while driving all Bikes and Scooters (Geared/Non-Geared) of any model. Easy to open and wear - just unzip the carry bag and wear the Jacket and Trouser inside to enjoy the Monsoon and forget worrying about getting wet. The Micro Polyester fibre makes it completely waterproof and the TH4 material makes it breathable to prevent excessive sweating, the two front pockets provided on the jacket helps you to keep valuable stuff like Watch and Mobile Phone to prevent them from getting wet. The complete rain coat packed inside a zip bag is very light weight and easy to carry and very handy, the zipper can be put inside your Activa under the seat, in your car, inside Autofy Saddle Bags, Pouches etc. 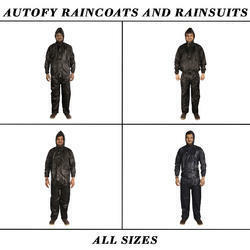 The Rain Suit comes in Multiple Sizes - S, M, L, XL, XXL - check the size in title before purchasing, this size is suitable for anyone wearing shirt size less than 42cm of any brand. This is a highly used product by bike enthusiasts, biker lovers and biker boys who love their bikes Royal Enfield Bullet Standard 350, Royal Enfield Bullet Standard 500, Royal Enfield Bullet Classic 350, Royal Enfield Bullet Classic 500, Royal Enfield Bullet Classic Desert Storm, Royal Enfield Bullet Electra, Royal Enfield Bullet Thunderbird 350, Royal Enfield Bullet Thunderbird 500, Avenger, Pulsar, Duke KTM, Harley Davidson, Yamaha FZ, R15, CBR, Ninja, Apache, Hayabusa and other bikes. This is also compatible with Honda, Hyundai, Maruti Suzuki, Toyota, Tata, Renault, Mahindra, Ford, Volkswagen, Fiat, BMW, Chevrolet, Audi, Jaguar, Mercedes-Benz, Nissan, Land Rover, Datsun, Volvo, Skoda etc. This Raincoat from Autofy provides full coverage to both front rider and pillion rider and is available at a very reasonable price. Gone are the days when you were hesitant in stepping out of the house with your partner in rainy season out of the fear of getting wet. The micro-polyester fibre makes it completely waterproof, in spite of being made of TH4 material, the raincoat is also breathable and therefore does not cause excess sweating because of trapped moisture. The unique feature about this raincoat is that it features a transparent vinyl section to cover the headlight of your bike. 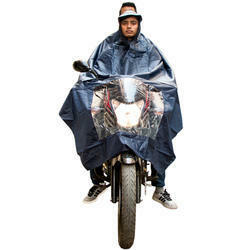 Therefore, the whole bike is covered but the visibility is not compromised and can easily be used on rainy nights. So next time you think of hitting the highway in monsoon, make sure you carry Autofy Micro Polyester Complete Rain Suit / Rain Coat / Rain Wear and Carry Bag for 2 Bike Riders with you. This is a must have accessory for biker boys having Bajaj Avenger and Royal Enfield Bullet, Royal Enfield Classic 350, Royal Enfield 500, Thunderbird and Royal Enfield Twinspark, Pulsar, Duke KTM, Harley Davidson, Yamaha FZ, R15, CBR, Ninja, Apache, Hayabusa and other bikes.